The gallery is housed in the ground floor of a handsome eighteenth century building at the top end of Maldon High Street, within Maldon's conservation area. Surrounded by an eclectic mix of Victorian, Georgian and modern architecture, visitors will also be able to visit an interesting array of boutique shops, coffee houses and restaurants. After enjoying Hayletts Gallery and Maldon High Street, take a wander down to the quayside overlooking the river Blackwater and view our famous Thames Barges and watch the world go by over a drink at one of the waterfront pubs. 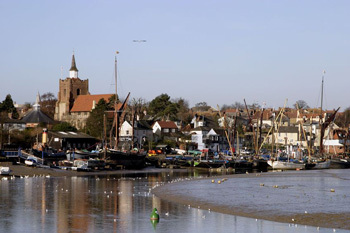 Maldon is one of Essex's earliest recorded towns. The main part of the town is thought to date back to the 5th Century AD but the surrounding area was inhabited as early as the Bronze Age and subsequently by the Romans, Saxons and Vikings. Positioned on the river Blackwater the town was ideally placed for maritime trade and became an important trading port for many centuries. Unfortunately it was also vulnerable to attack by the Vikings, who eventually defeated Earl Brithnoth and his men at the Battle of Maldon in 991. A statue commemorating Brithnoth has been erected at the end of the promenade looking down the estuary towards the battle site. The statue was created by local sculpture John Doubleday. More recently the town has become known as the home of Maldon sea salt, which is made from the salt crystals of the salt marshes following methods used in the Maldon area for over 2000 years. Hythe Quay takes its name from an Old Saxon word meaning landing place. It has been in use for a thousand years and is a lovely picturesque spot with views over the marshes, two good pubs, and an award winning park and of course the famous barges. The Plume Library in Maldon is one of the oldest reference libraries in the UK and is of great National importance. It was established by Thomas Plume in the 17th century it is still home over 6000 books including many from the 16-17th Century. Maldon Moot hall is a one of the earliest brick buildings in Essex, or indeed England, having been built in approximately 1420. It has a magnificent spiral staircase, Dickensian well court, Georgian dado panelled council chamber and remnants of old borough gaol with prisoners exercise yard and views of Maldon from the roof. Close to the gallery are the remains of St Giles' Hospital. This Grade 1 listed building is said to have been founded by Henry II, to house lepers. The existing ruins date from the 12th Century.